I am SO excited to share this interview with all of you today! I "met" Kimi on Instagram when I discovered her feed full of beautiful kimono and cloche photos. 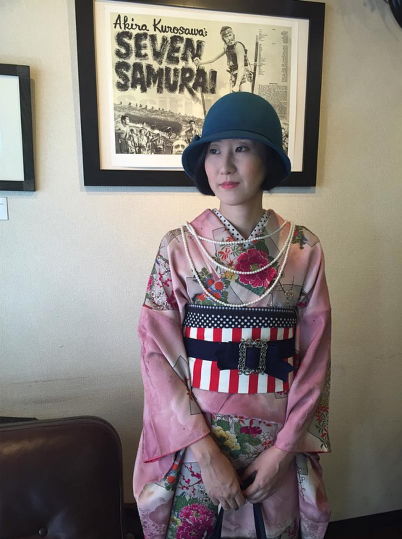 I am intrigued by the way she mixes traditional Japanese kimono with vintage Western pieces--such as 1920s hats, shoes, and necklaces--for a really unique personal look. It's not a combination I've seen around, so I decided to ask Kimi about it and to discover more about Japanese culture. Without further ado, here is Kimi! Kimi. But I go with @mainichichiisanashiawase on my Instagram, which means “a spice of small happiness each day." Born and raised in Japan, and I have lived in the States and Australia in the past. Why do you love to wear vintage clothing? I find it much more comfortable to dress in a vintage style than to follow the current fashion. I don’t have to think about if I “look good or not” from others, because the definition of what is “cool” and “looking good” between myself and the people around me in general are often different, if that makes sense. Being in a different category, I just really enjoy what I wear. I see on your Instagram account that you wear kimono a lot. Is this common in Japan? Generally speaking, no, it’s not common for the Japanese to wear kimono in daily bases. 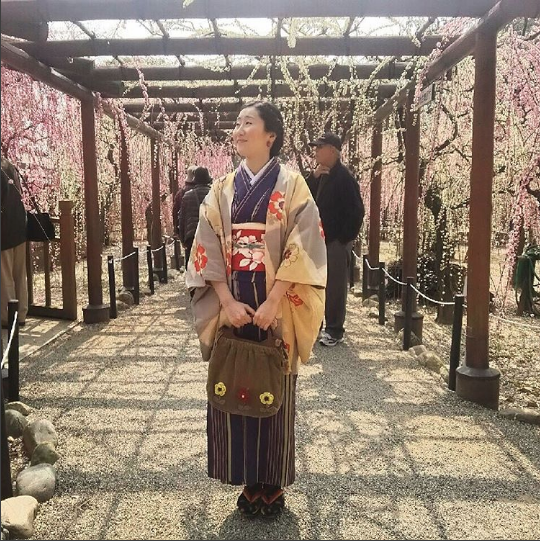 There are different types of kimono, though, depending on a situation; formal kimono such as for the weddings and tea ceremonies, and casual kimono for more relaxed occasions. So for those who are engaged in traditional activities, I would say wearing kimono is a part of life. As for me, I wear them as part of my hobby, so I dress casually. I like to go out on a café in kimono because it gives me a whole new perspective than to go there with a t-shirt and jeans (please don’t get me wrong, I do wear t-shirts and jeans as well). It’s just a refreshing experience for me. 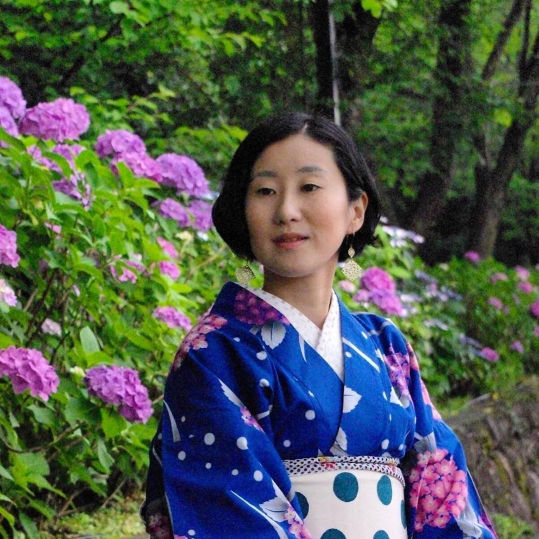 People used to wear kimono all the time back in the old days simply because they didn’t have western style clothing. Nowadays, it is difficult to wear kimono, or make it part of your life if you don’t know how to wear them on your own. It requires certain skills. It took me some time until I could wear them without feeling like I need to skip lunch because the obi (the sash belt) being too tight. But as you get used to it, everything becomes more natural and wearing kimono becomes not much of a big deal to start off your day. Now I’m at this phase and, soon, will celebrate a year since I started to make this tradition as my most exciting hobby. And as I attend to some kimono events, I have met a lot of like-minded people who are totally in love with the beauty of this outfit. 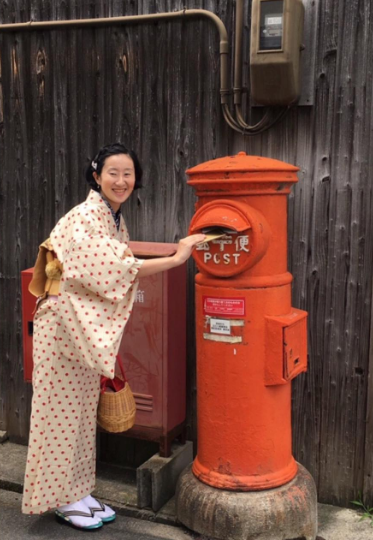 They all have different reasons, backgrounds, and preferences in their own unique way, but one thing in common is that they are taking in the essence of vintage style in their daily lives and enjoying the kimono life. 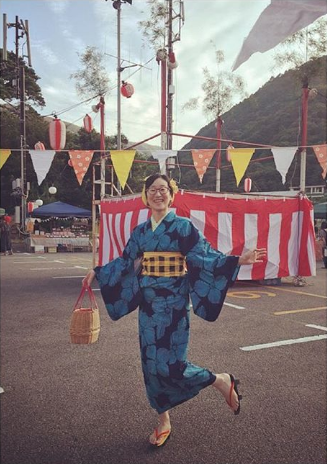 So, to answer the question of whether wearing kimono often in Japan is common or not, I would say it is not a major custom, people look at me and give me the stare when I walk down the street (possible reasons mentioned later), but there are people like me who prefer to wear them as much as they have the opportunities. Do you enjoy wearing clothing from a certain era or decade? If so, why is it your favorite? 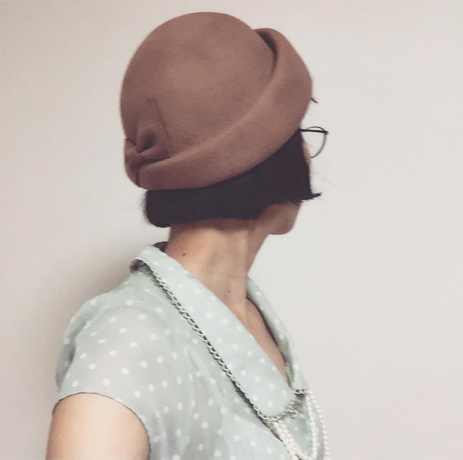 I’m not too particular about the era, but I do prefer the 1920s styles, especially with the cloche hat and the short hair and all. 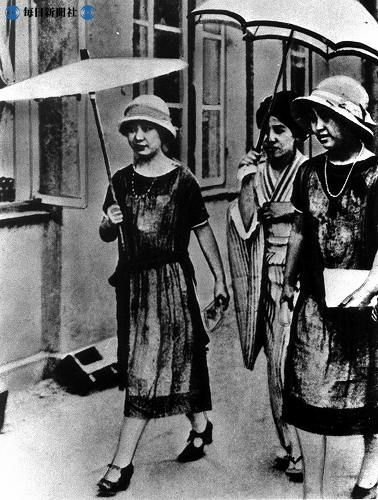 During that time in Japan was the period where the “modern girls” or “moga” was appeared, the ones who followed the westernized fashions. It was a big shift change from wearing kimono and having a longer hair. When I dress up in the Western vintage style those are the images I have on my mind. But I also like dressing up in kimono. So this contradicts a bit. Where does this take me, the one who love to stay “classic” but also wants to be a “moga”? Wants to be a modern but also wants to remain traditional? 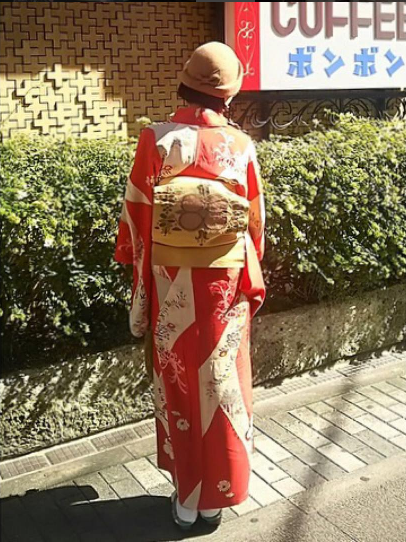 The answer I believe is that it can co-exist, and that’s a privilege they couldn’t have back in those days: wearing kimono with a shorter hair with a clothe hat on. How can you tell how old a kimono is? Do you have any good resources for people that may want to learn more about vintage kimono? From what I’ve learned so far, vintage kimonos tend to have slightly longer sleeves, and the width and the length of the dress are shorter. There often used the red-colored fabric as the inner-side of kimono. However this may not necessarily apply to all vintage kimonos, there are ways to tell around which era they are made. But to really tell how old a kimono needs more study focused on the materials such as fabrics, patterns, how they are made, etc, because there are some characteristics unique to each era. 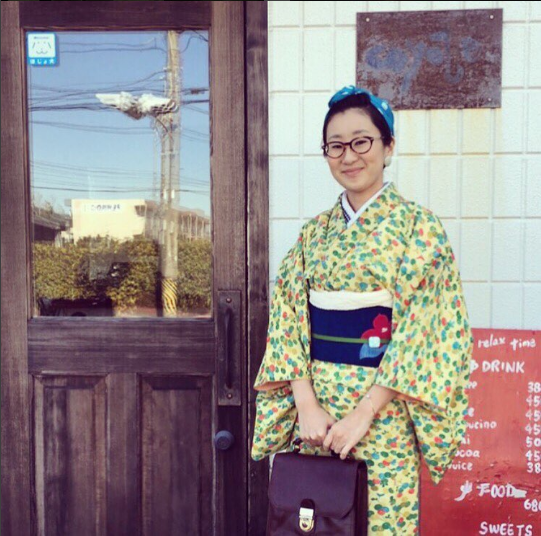 From your perspective, what would you say to non-Japanese about wearing kimono? Do you see it as respecting the beauty of the culture, or would it be offensive? I would say go for it! I don’t think it is offensive, I think it’s very nice of them that they are taking in the essence of the Japanese taste in their fashion. 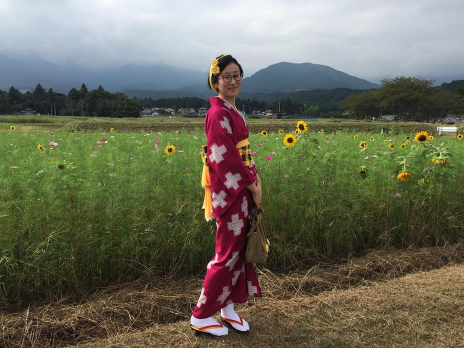 In fact, I’ve seen some non-Japanese people on Instagram who are enjoying their kimono life and I think it’s absolutely fantastic. As someone who enjoys casual kimono, rules doesn’t really matter. 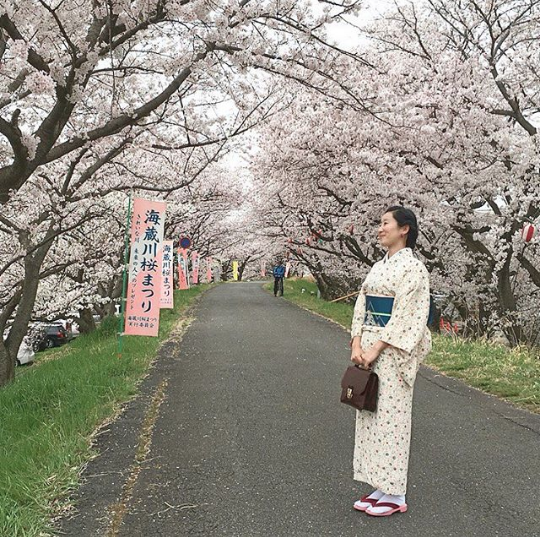 But there are some most basic rules that you should know, like wearing it with the right side tucked under the left (and not the other way), or basic manners and behaviors when wearing a kimono. If you know these basic ideas and the meaning behind that is connected to the culture, from there you can apply them and improvise other parts on your own way. I've also seen you wear vintage kimono mixed with more Western-styled vintage pieces (hats, shoes, etc.). Do you create these looks on your own, or are they inspired by Japanese women who were doing the same thing in the past? Those mixed style of the Western and the Japanese are becoming common among some kimono enthusiasts, especially among the younger generations, but traditionally speaking, those ideas/concepts are not included as part of the mainstream culture, thus looked almost as a “taboo” at times. Of course, this differs in degree on what do they focus on their style; some prefer to stick with the basics, while others love to play with it by blending the elements of both original and modern. As for me, on some days I want to keep it simple and other days I feel I want to put extra something to the look to make it more “fun” and “exciting”. And it works well in my eyes. But there are older generations who see me in such fashion and see it as favorable. In fact, with my experience, most of the people I’ve encountered, their reactions have been positive. 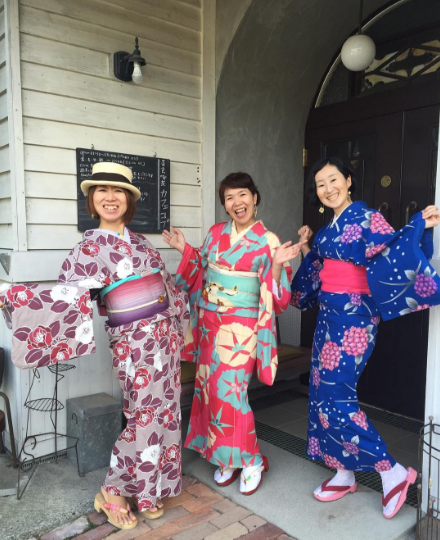 They say it is such a good thing that younger people are interested in wearing kimono. And I see that is the point. Maybe age and generations don’t even matter. Some people have grown up in an environment where wearing kimono must be formal and stick to the original. I understand that it may be difficult for them to accept that kimono culture is “shifting”, and more “opened up” in some occasions compared to, say, 30 years ago. 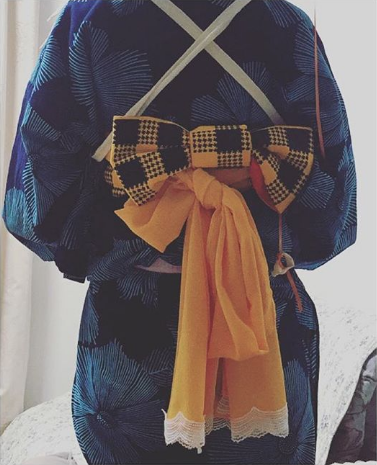 I learned so much from Kimi's answers and am even more impressed by kimono than I was before. What a beautiful part of Japanese culture! Did you learn anything new from this interview? What are your thoughts on kimono, or of mixing traditional clothing with vintage Western pieces? I also liked to hear what Kimi had to say about non-Japanese wearing kimono, as it is something I have wondered about before. And, I didn't know that you wear it tucked right under left- so that's good to know too. I'm glad to see an article on kimonos. Yes in Japan only the dead are buried wearing kimonos wrapped right over left. Brocade and shibori kimonos are prohibitively expensive. A more affordable option is the yukata or summer kimono. Traditionally they are cotton indigo with ikat kasuri patterns. I have made some shorter 'kimonos' from indigo dyed yukata 14 yard by 14 inch fabric rolls purchased on ebay. These I find more casual, easier to wear (almost like a jacket) and clean. I've looked into the process of making a kimono out of a roll like that, and it's so intriguing! 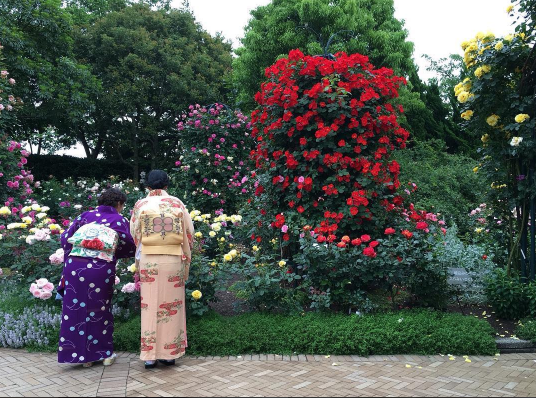 Kimi's photos (and kimonos) are beautiful, and her answers really interesting - thank you for sharing them. I love the way she mixes her pieces. I do too! It's fabulously creative. This was such a fascinating read, thank you so much for featuring her! I'll have to go follow her right away, her style is so beautifully unique. 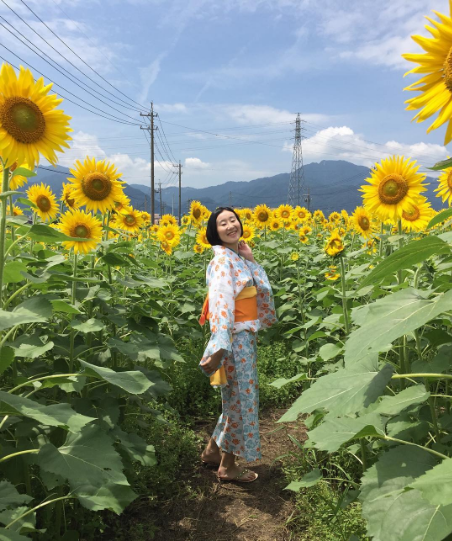 I love the look of kimono and I really love "Moga" girls, so it's really cool to see someone who embraces and finds a way to explore both of those sides of Japanese fashion history. Isn't she lovely?! I really enjoyed the insight she gave. You can't always get cultural insight like that from just old pictures; you really have to talk to people and be in the culture to capture thoughts like that. So wonderful! This is such a neat post, I learned SO much! I love your intercultural blog posts; thanks for making intersectionality part of your blogging! Off to follow Kimi!!! Aw, thank you so much! I'm glad you're enjoying it and learning from it! This was such a wonderful read! I had not previously seen anyone mix kimono with their own personal style (such as hats, western shoes, etc.) I really love the way Kimi mixes her own stylish touch with them! All of her answers were so intriguing. Thank you for sharing! This is really interesting. I remember reading an interview with a kimono designer and how they are trying to save the kimono and modernize it. 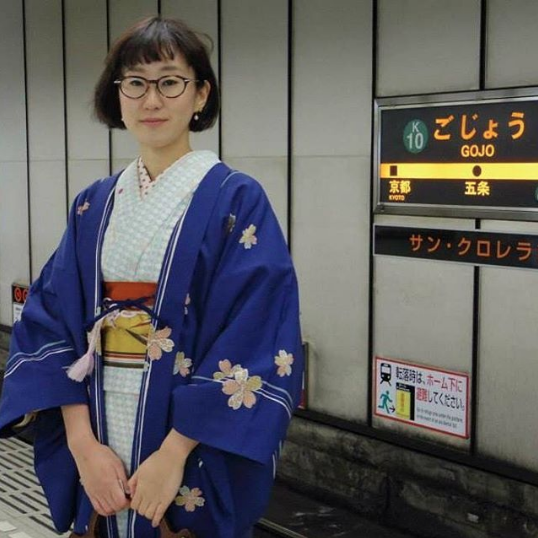 It seems many Japanese people prefer if Westerners wear kimonos in hopes to keep the culture alive. The designer, like Kimi, was pro customization. I've also read that! I think it was an article on a Japanese news site... But yes, I think it's the idea that things we're used to we can take for granted as boring. But when someone else sees it with fresh eyes and thinks it's awesome... it can remind us how cool it actually is! This series is thoroughly absorbing, I was fascinated to hear Kimi's philosophy behind her clothing choices, and her cultural context. I will go and find her on Instagram now! 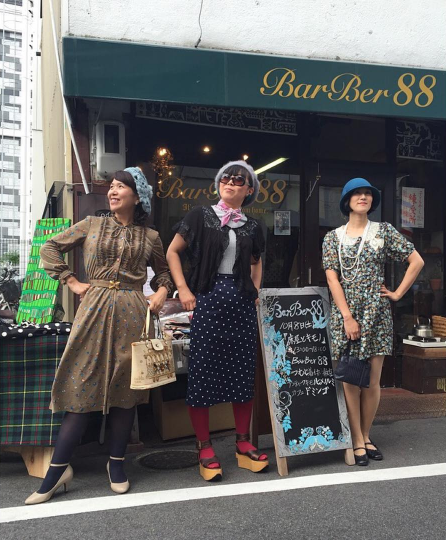 I really love your blog,you all look stylish and adorable in these unique vintage outfits. This is one of my favorite articles on your blog. So much so after re-reading it I am following Kimi. Such amazing style!